League of Legends topped the charts last year, with over 1 billion hours of content viewed – almost double that of Counter-Strike: Global Offensive. 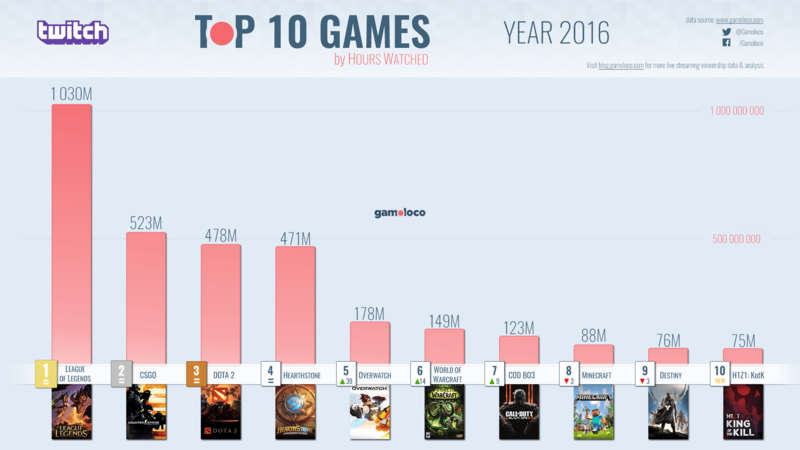 I am not surprised to see MOBAs and first-person shooters make up the majority of this list. Clearly, Riot holds the keys to success, taking the number one spot once again. I expect CSGO and Dota 2 will continue to maintain their runner-up positions a little longer. Though given Overwatch’s rapid rise in popularity and an esports circuit looking to take off this year, I assume Blizzard’s shooter will continue its upward trend. I must admit, it’s disappointing to see that no fighting games made the top 10 list. Last year, more people tuned in to watch EVO on Twitch, compared to ESPN. On the last day of EVO, Street Fighter V reached over 208,496 viewers on Twitch, while ESPN averaged 201,000 viewers. Smash is another franchise that continues to see consistent growth, and I’d imagine if Nintendo is ramping up its esports initiative, I’d expect to see some new milestones this year.